You’re not likely to walk past this local corner café. Among the green gardens of Springfield Street, Peddler Café fits into the décor with its green tiles, Bobo school chairs and glass jars of brown sugar. The locals, call it their local too, with residents from near by enticed for the coffee, food and relaxed atmosphere. The service, like the neighbourhood, is friendly and relaxed. Grab a coffee, a bite, or bring your work and you will feel at home here. On a pleasant Melbourne day, you can enjoy the outdoor seating. Or opt for the slightly more atmospheric inside, abuzz with chatter. There are many vegetarian options for breakfast, brunch and lunch. Highlights include the ‘Breakfast Board’ with smashed avo, halloumi, dukkah an egg, toast, muesli and an orange juice. Or field mushrooms served on a rosti with goats’ cheese, onion jam and a poached egg. The vegan poke bowl is full of healthy goodness. 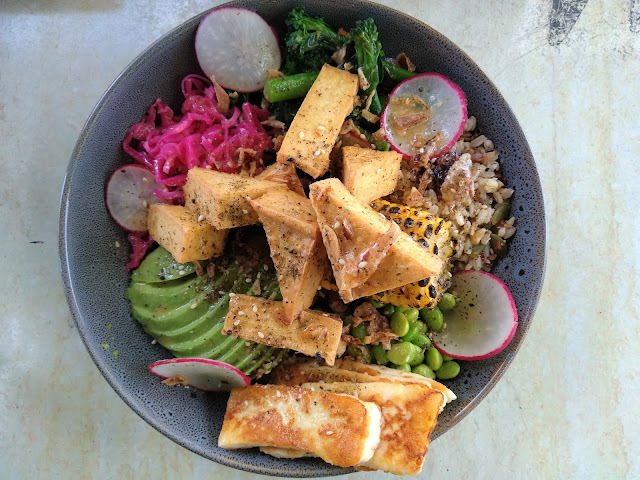 It includes delicious, smokey, charred corn; edamame, peeled and blanched; firm tofu, shallow fried for a crispy edge and seasoned with salty dukkha; crunchy, dark green broccolini; sliced and fanned avocado; raw radish slices; pickled but still crunchy cabbage, and; rice with quinoa and grains flavoured with plump, soaked cranberries. I ordered the extra of halloumi, which was unnecessary but delightfully warm with a soft inside, a browned crust and not too salty. It is just what I need at lunch time: a big bowl of vitamins and flavour. A healthy bowl of goodness - vegan poke, with halloumi extra. The coffee is your typical Melbourne dosage, with any bizarre order accepted and coffee art obligatory. I really enjoy this café. It is just the right blend of laid-back and well-done.